Ever hear a 'man of God' say, "You will be removed and sinners will stay here !" The so-called 'man of God' continues the monolithic lie. he weaves and blasphemes the Lord of Hosts, Jesus our King. he spews venom from his lips, to blind the eyes that pacify the presumptive elect. Jesus even goes so far, as to ask them, are you sure you get it? They replied "Yea Lord" These simple fishermen understood this simple message, but today's shepherd's are clueless and in brutish rebellion, for the lust of tantalizing DVD and book sales. At the end of the world the angels will sever the wicked from among the just. Nevertheless the stiff necked and profane 'man of God' vomits the opposite doctrine to his fold. So that the tower of his pre-tribulation fable does not suffer. Beloved children, do not listen to the 'man of God' that speaks false teachings. Any man that alters the exact crystal clear words of Christ is a false teacher and a false prophet. We are not taken out from the wicked, the wicked are taken out from us ! Jesus will send forth His sealed or sanctified (see 144,000) angel army and stab all the wicked sinners and those that are joined to them. Thus fulfilling Psalm 91 which states a thousand will fall at thy side and ten thousand on thy right, but it will not come nigh thee. With your OWN eyes you will see the reward of the wicked. Beloved there are four groups of humans to fulfill God's role for mankind. Each of these groups are addressed separately in scripture for the time of the end. 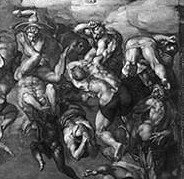 The 'Living Saved and Living Lost', both groups go through the tribulation, culminating with the Lamb's Slaughter of the 'Living Lost' terrestrial bodies. The 'Dead Saved, Living Saved' and 'Living Lost', both leave their terrestrial behind and are all raised after the tribulation and their terrestrial bodies are burnt upon piles in the Euphrates and in the global melt down. These three groups arrive at the marriage supper. The Living Lost are found to be without wedding garments (glorified bodies) and are asked about their works towards the "least of these"; they fail the test and are then sent into utter darkness to await the final solution, the 2nd death of the celestial. This only leaves one remaining group the 'Dead Lost'. Child of God be wise as serpents; when Jesus comes at the end of the tribulation, we are not taken into Heaven alone. All the Living goats in the 'Lamb's Slaughter', come with us to be judged in one net. Jesus said, both the good and the bad arrive at the marriage supper. The only group that does not get taken up is the 'Dead Lost' goats, whom were buried in a grave from the beginning of time to present. The Bible calls them Gog and Magog in Revelation 20. After the 1000 years: satan is let loose from his prison and goes IN the earth to deceive Gog and Magog (ancient sinful humanity), they are resurrected back to life (2nd resurrection), they attempt to attack the New Jerusalem and are destroyed by fire directly from God; then at the White throne judgment they suffer the 2nd death (lake of fire) with all the recent living dead. This last group (Dead Lost) are the walking dead, zombies of satan. They get a double portion of wrath for their rebellion, the 2nd death. This will also make for a great fireworks display for the entertainment of His bride. This four group break down, also disproves satan's pre-trib rapture lie. Because if Jesus came at the beginning of the tribulation, he would have already slaughtered the 'Living Lost' (because that is what He does at His return) at the beginning of the pre-trib and THEN taken the 'Dead & Living Saved' with Him. This would leave no one on earth for the tribulation. Therefore this pre-tribulation scenario is impossible. Remember according to Jesus, the tares must die first. If not, this would cause a major problem in prophecy; since the entire tribulation period would be unpopulated. Then God's majesty and power demonstration show (the tribulation), would not have an audience to see the reward of the wicked. See the Timechart for a clear visual representation.